Normally you find meringue swirled on top of lemon or chocolate pies, but here it dresses up a classic go-to dessert. 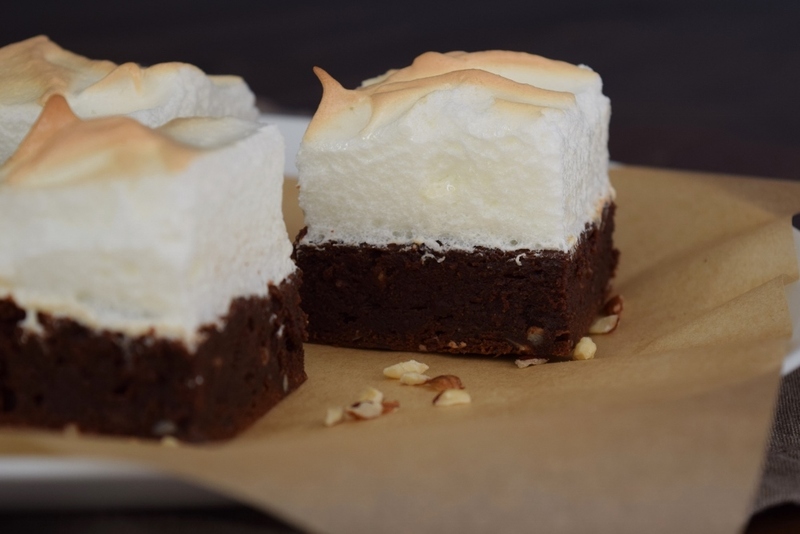 The tall meringue adds some drama and sophistication while its lightness balances the denseness of the brownie. It’s a little fancy, but not too fancy, like wearing a suit with Converses. 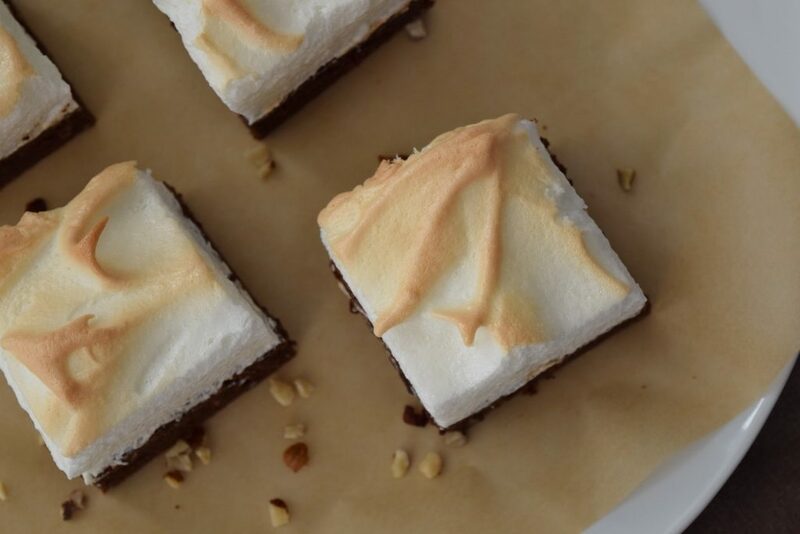 The hazelnuts compliment the chocolate like nutella and give the brownie some texture. 1. Preheat oven to 350° and grease a square baking pan. 2. In a double boiler (an empty pot over another pot of simmering water), melt the chocolate and butter. This recipe is for unsweetened chocolate. Don’t try to use semi-sweet or bittersweet! Once melted, take off of heat. 3. Meanwhile, whisk together the two eggs, sugar, salt, and vanilla in a large bowl. 4. Gradually add the melted chocolate and butter, bit by bit, into the egg/sugar mixture. I usually do it in three installments, whisking in between additions. 5. Add the flour, stirring until just combined. Don’t overmix. Then toss in the hazelnuts and stir a couple more times. 6. Transfer to the greased baking pan and bake for about 25 min. 8. Gradually add the sugar to the egg whites, and whip until stiff, glossy peaks. The meringue shouldn’t move when you take out the whisk or shake the bowl. 9. Pull out the brownies from the oven after about 20-25 min. The brownies should be almost done, but not completely (still a little wet in the center if you stick it with a toothpick). 10. With a rubber spatula, spread the meringue on top. Use the back of a spoon to create some peaks and valleys. 11. Bake for 8-10 min or until the top browns, but not burns. Let cool at least 30 min and then cut into squares. Because of the meringue, these are best eaten the same day you make them, and really within the first few hours. 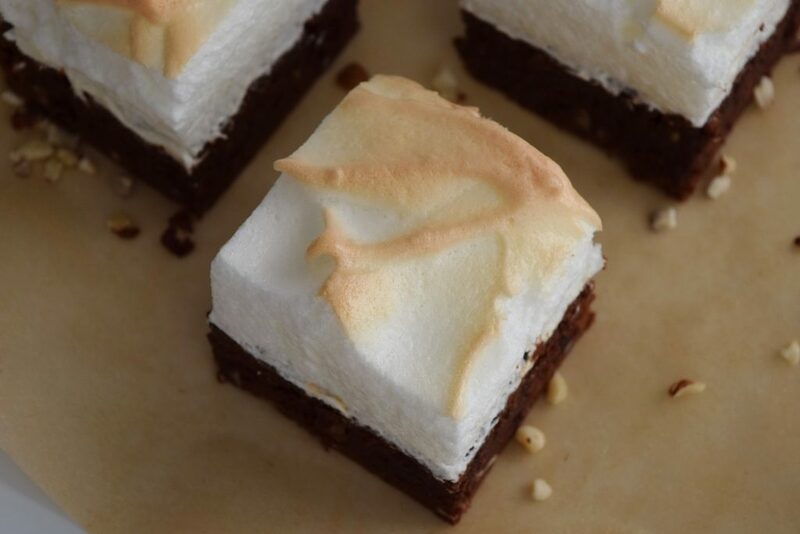 If you plan on serving them a day later, you might cook the brownies one day, and then finish with the meringue right before you serve them. Enjoy!